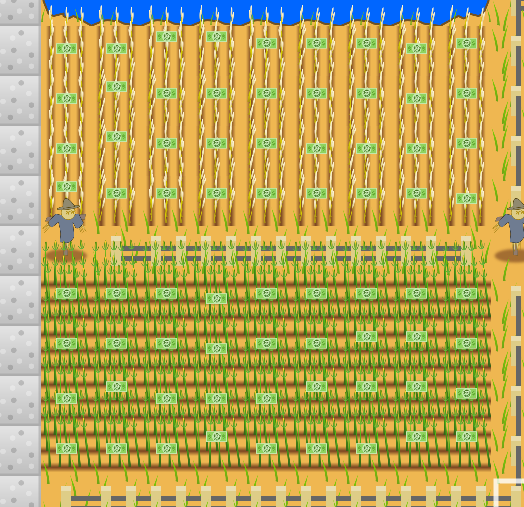 Whether you are just getting started with the epic farming simulation My Land or you are a seasoned pro, this tips and tricks article will give you some ideas on how to turn your land into a thriving and profitable business venture! At the very beginning of the game, plant a few evergreen trees in random spots throughout the map. You don't need a lot, maybe just five or six. The reason is that the trees are the cheapest and easiest way to raise the attraction level of your land, without raising your property tax value. They also spread automatically on their own. The only downside is that they take a long time to grow. Planting a few of them early on will let you avoid spending big money if you want to plant a forest later in the game. And you can always just build over them if they get in the way. In step one, I mentioned that trees will spread on their own over time. But grass is a lot faster and more aggressive in spreading, and can crowd out trees and kill forests before they are even able to take root. Try to keep your grass contained into fenced in areas where you actually need/want it to grow. It may be a lot more profitable in the long run to raise livestock, but they are slow to mature and expensive to maintain, especially at the beginning of the game. Start out with a couple of cheap crops like Wheat and Corn and get a cash flow routine going before moving in to livestock. Some animals, particularly pigs, can go into crazy breeding mode when confined in a small area. If you have too many cows in a small area, the grass on the land will not be able to feed them all. When you have uncontrollable breeding taking place, you should sell the older animals to make room for the younger ones. Also keep an eye on the sell value of your animals. Do not let them sit around for a long time after they reach their peak value. You are only wasting money feeding them at that point. Don’t let your animal populations get out of control. Visitor attractions like sidewalks, toll booths, vending machines, and pizza stands are fun to build, but if the attraction rating on your land is below 50%, you will never have enough visitors to pay off the initial investment. Before trying to build visitor accommodations, use evergreen trees and water to increase the attraction rating of your land. Got more tips? If you have some other strategies and ideas that have worked for you, please share them here on the forum so that other people can take advantage of your experience! If you haven’t tried My Land yet, check out the official My Land website below for download links on various platforms. Now go out there and start working your land!